Maybe it was the lack of whiskey, harder to find now that Idaho was entering its second year as a “dry” state. Maybe it was the specter of a bloody war being fought in Europe, threatening to drag the United States into the conflict. Or maybe it was just another dreary gray winter in North Idaho. Whatever the reason, Sandpoint started 1917 a bit on the grumpy side. The fire chief was dismissed over complaints. “Bud” Gibbs, known as “the king of bootleggers,” was arrested with twelve quarts of whiskey wrapped in his blanket. The dispute between Humbird Lumber Company and Sandpoint Water and Light Company escalated to the public utilities commission in Boise. Two employees of the local match block factory beat each other up. And the unfortunate May Hustead was arrested for mail fraud right before her wedding. And that was just the front page news. Billy Abbott’s saloon, originally in the right hand section of this building on the corner of First and Bridge, closed after statewide prohibition went into effect. It was replaced by a soft drink parlor. On a brighter note, two well known businessmen were opening a new soft drink parlor in the former Abbott saloon on the corner of First Avenue and Bridge Street. Although the newspaper made no mention, downstairs in the Abbott building labor organizers were busy recruiting new members and laying the groundwork for actions that transformed the logging industry. They were members of the Industrial Workers of the World, better known as Wobblies. A small group of radical trade unionists, socialists, and anarchists met in Chicago and founded the IWW in June 1905 with the goal of organizing all workers, regardless of skills, gender, or race, into “One Big Union” in opposition to the capitalist class. For the next fifteen years, Wobblies had a large impact on national labor issues. It didn’t take long for the IWW to arrive in North Idaho. Almost before the ink was dry on their national charter, Wobblies organized a local chapter in the town of Granite, south of Careywood, in July 1905. They kicked things into high gear in 1909 with the free speech fight in Spokane that drew hundreds of Wobblies from across the country and landed more than 500 members and supporters in jail. While the IWW continued to stage isolated actions around the Inland Northwest, including a 1911 strike at the Cocolalla Ice and Fuel Company, they drew the most attention for a series of strikes in cities on the west coast of Oregon and Washington. They lost these early strikes and faced fierce opposition from mill owners and businessmen. Despite these setbacks, membership in the IWW increased as they led the effort for higher wages and an eight-hour day. Tensions and violence escalated in 1916 during a strike in Everett, Washington, that left a deputy sheriff, National Guardsman, and five Wobblies dead and another fifty people seriously injured. These actions generated both anger and sympathy toward the Wobblies, and the divide only deepened when the subsequent trial of IWW men ended in acquittal. 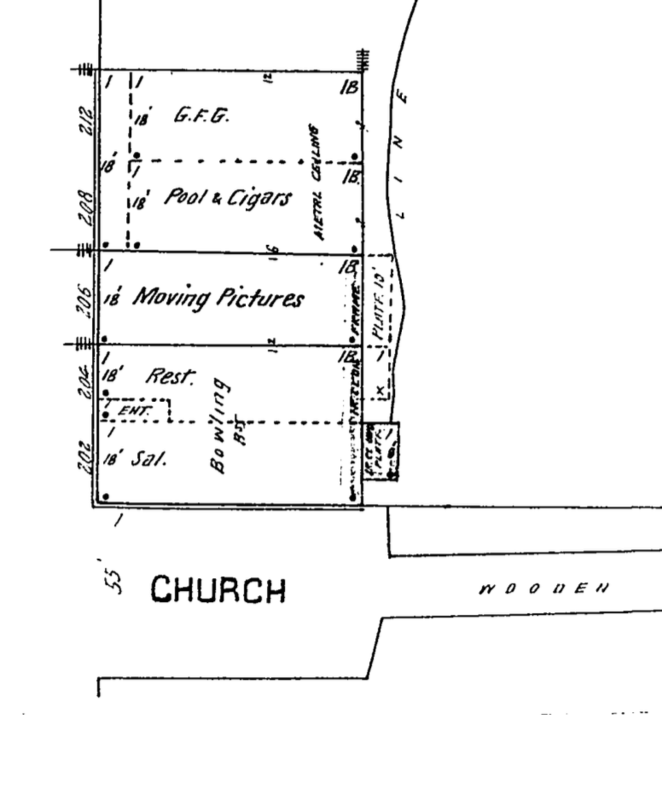 Screen shot of Sanborn Insurance Co. map of Sandpoint, December 1915. The bowling alley in the basement of this building, on the corner of First and Bridge (labeled here as Church), housed the IWW union hall in 1917. As the actions in Everett were playing out, IWW organizers fanned out from the Spokane headquarters into logging camps from St. Maries to Bonners Ferry. The Sandpoint chapter, Local No. 400 of the IWW, set up shop by November 1916. It initially was located on Main Street but within a short time had moved to the Abbott building on the corner of First and Bridge Street. As the Wobblies built their organization in North Idaho, they laid out a series of demands to benefit loggers. They wanted an 8-hour day, with time and a half for overtime. The men currently had to work a full 10 hours, with only Sunday off. The IWW also asked for a raise to a minimum salary of $3 for an 8-hour day. These echoed demands made by workers across the country at this time. Loggers had another concern, however, one that probably was more important to them even than money or hours. They had long complained about squalid living conditions and poor food in logging camps, but it often seemed that complaints fell on deaf ears. This contributed to high turnover among loggers and a simmering anger against lumber company owners and management. During this time, most logging was done during the winter months. This meant that the men spent the dark and cold winter in the woods, living in camps run either by contractors or lumber companies. Sixty men or more slept in long, poorly ventilated bunkhouses, heated by wood burning stoves. The men had to supply their own blankets and slept on hard wooden bunks, stacked two high, with only a pile of loose hay or straw to cushion their tired bodies. There were no bathing or laundry facilities, only a basin or wooden trough to hold water heated on the stove. The smell became unbearable at the end of a 10-hour day when dozens of exhausted and sweaty men removed their boots and hung their wet socks and shirts to dry. Even Ferdinand Silcox, Regional Forester for the US Forest Service, sympathized with loggers. He noted that horses were treated better than men in many camps since barns were better ventilated than bunkhouses. It was these conditions that made loggers across the Pacific Northwest receptive to IWW organizing efforts. The first results locally came in early February 1917 when close to 100 men walked off work at Carlson’s logging camp to protest bad food and camp accommodations. The newspaper identified them as members of the IWW. At the same time, Humbird Lumber Company experienced its first strike when approximately 100 skilled men quit work to protest a mandatory hospital fee that was taken from their paychecks. The sawmill men apparently were not Wobblies and the company was anxious to settle their strike quickly. They soon returned to work following satisfactory negotiations. Elizabeth Gurley Flynn. Photo from Library of Congress, 3a48983r. About a week later, the local IWW union brought a well-known firebrand to Sandpoint to speak. 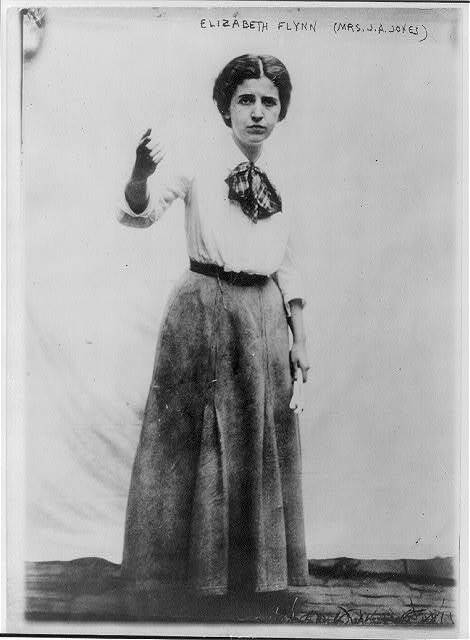 Elizabeth Gurley Flynn was a dark haired young woman, just 26 years old, but already she was nationally known as a rousing orator and IWW organizer. Her presence in Sandpoint drew nearly 700 people to the Rink Opera House [see previous post] in early February where she championed labor’s cause. She didn’t disappoint her audience who frequently interrupted her talk with loud applause. And it wasn’t just rough and rowdy loggers who listened. The crowd also included a cross-section of the local community, with businessmen, clergy, and farmers who seemed supportive of the important labor issues of the day. Protests continued later in February when another 32 loggers, identified as members of the IWW, walked out of Humbird’s Camp No. 2. These initial strikes seemed isolated but similar actions were taking place across the Pacific Northwest as loggers, angry and fed up, went on strike to protest long hours, low wages, and bad living conditions. Most of these labor actions were short lived but they were the opening skirmishes in a much larger confrontation that erupted a few months later. 1917 had only just begun. “Fire Chief Is Dismissed,” Pend d’Oreille Review, 5 January 1917, 1:1; “King of Bootleggers Languishes In Jail,” Pend d’Oreille Review, 5 January 1917, 1:2; “Water Company Appeals To Boise,” Pend d’Oreille Review, 5 January 1917, 1:3; “Axe Used In Encounter,” Pend d’Oreille Review, 5 January 1917, 1:4; “No Wedding Bells Will Ring For Her,” Pend d’Oreille Review, 5 January 1917, 1:6; Map of Sandpoint, Idaho (New York: Sanborn Map Company, December 1915), p. 8; Howard Zinn, A People’s History of the United States: 1492 to Present (New York: HarperCollins Publishers, 2001), 329-376; “Industrial Workers of the World Charter, Granite Lumbermens Union No. 118,” 7 July 1905, document on file at Bonner County Historical Society; Ross Reider, “IWW formally begins Spokane free-speech fight on November 2, 1909,” HistoryLink.org Essay 7357, http://historylink.org/File/7357, posted 6/22/2005, accessed 1 March 2017; Jim Kershner, “A fight for free speech,” Spokesman-Review, 1 November 2009, http://www.spokesman.com/stories/2009/nov/01/a-fight-for-free-speech/, accessed 1 March 2017; “I.W.W. Ice Workers Wanted Higher Wages,” Northern Idaho News, 14 February 1911, 1:4; John McClelland Jr., Wobbly War: The Centralia Story (Tacoma: Washington State Historical Society, 1987), 1-21; “I.W.W.’s Coming,” Northern Idaho News, 11 April 1916, 1:3; “8-Hour Day Is Asked of R.R’s,” Northern Idaho News, 22 August 1916, 1:6; “Railroad Strike Is Called Off,” Northern Idaho News, 5 September 1916, 1:6; “I.W.W. Queries City Council,” Pend d’Oreille Review, 10 November 1916, 1:6; “I.W.W. On Trail Of The Lumbermen,” Pend d’Oreile Review, 8 December 1916, 1:5; Nancy Foster Renk, A Glorious Field for Sawmills: Humbird Lumber Company, 1900-1948 (Boise: Idaho Department of Transportation, 2014), 55-59, 76-78; “I.W.W. Woods Crew Quits Job At Carlson’s Camp,” Pend d’Oreille Review, 2 February 1917, 4:2; “Mill Men Will Return To Work,” Northern Idaho News, 13 February 1917, 1:6; “Speaks On Labor Question At Rink,” Northern Idaho News, 13 February 1917, 5:1-2; no title, Northern Idaho News, 27 February 1917, 1:1. Photo of Elizabeth Gurley Flynn from Library of Congress, http://www.loc.gov/pictures/item/2005686058/. This entry was posted in Uncategorized and tagged Bonner County history, Elizabeth Gurley Flynn, Industrial Workers of the World, IWW, labor history, logging, lumber industry, Sandpoint history, Sandpoint Idaho, Wobblies. Bookmark the permalink. What happened between now and then? Good job Nancy. More to come. Thanks, Joyce! I plan to continue this with another blog post or two. It’s too big a subject for just one. Besides, I’ve always been interested in this story! Stay tuned. Wow I know the arc of this story but I just was looking to see if a write up of it could be found and here it is! Thank you for putting this up. If I credit you with the writing would it be ok to print and distribute this story? Free advertising for your blog I suppose. I’m a wobblie living here in Sandpoint. Hi Brian – I’d like to hear more about what you have in mind. Let’s talk via email. You can contact me at flumecreekhs@gmail.com. Thanks! keep checking for new info. you very much for the place. Really great post, I definitely adore this website, keep on it. OUTSTANDING Post.thanks for share..more delay.